I came across two examples of creatve writing worth sharing today. One from the Halifax, who kindly wrote to inform me that they had 'adjusted' my rate on my ISA from 5% to 4.75% 'to bring it in line with market rates'. This on the day that I opened my 2006/7 ISA with National Savings and Investments with an interest rate of 5.05%. I presume (to steal a phrase from the the presumably rather shortsighted Health Secretary Patricia Hewitt) they 'do not recognise that figure' ( or indeed the other 5% ones shown on www.moneysupermarket.com. ). "For him that stealeth a book from this Library let it change into a serpant in his hand and rend him. Let him be struck with Palsy and all his Members blasted. Let him languish in Pain crying alound for mercy and let there be no Surcease to his Agony till he sink to Dissolution. Let bookworms gnaw his entrails in token of the Worm that dieth not and when at last he goeth to his final Punishment let the flames of hell consume him forever and aye." Why the photo of a pink and blue thing? Well - new skills. Uploading it was the first one ( easy peasy when you actually bother to try) but also its one of the new things I intend to blog about - the new obsession of my life: quilting. The above quilt is not my first attempt because that is not actually finished: the patchwork is fine but a defective walking foot on my brand new machine chewed up all the backing when I attempted to machine quilt it so it is banished into a box until I can face the disappointing mess again. 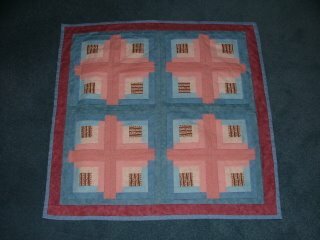 However, the above was my first finished attempt which has gone to my mother-in-law in Ballymena. 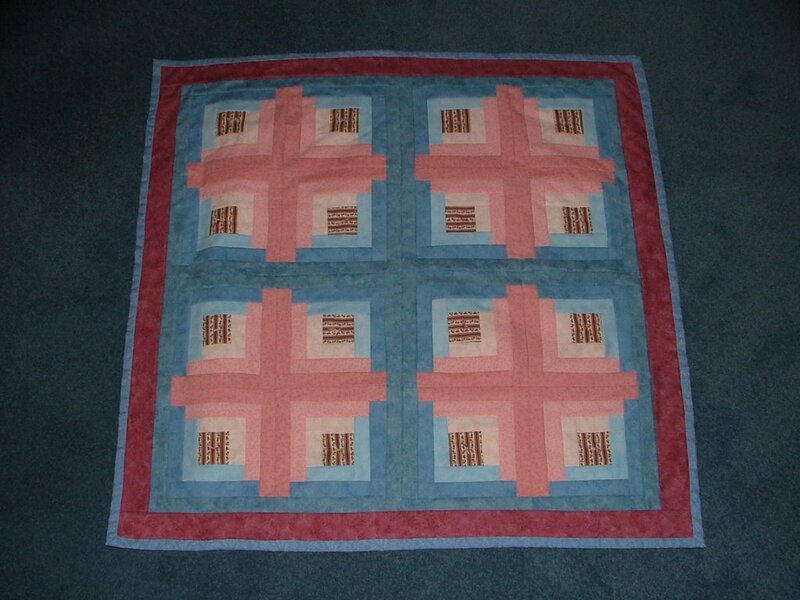 For the uninititaled it is a log cabin design which traditionally has a red plain square for the center design. I though I'd be different and use stripes which was fine until I came to rotate the bocoks to make the secondary pattern of the crosses. I forgot that the stripes would also rotate and some be verticle and some horizontal. Doh! In the end a quick rethink made the alternating a design feature rather than fault - but lesson number one was swiftly learned! www.serendipitypatchwork.com.au and http://www.serendipitypatchwork.blogspot.com/The sites belong to another exlawyer who deserves to be today's link becuase I emailed her today having found her in a magazine and got a reply in minutes despite being a stranger on the otherside of the world - don't you just love the internet?! Thank you to all those who requested that I get my finger out and return to the blog. I shall be making more effort in future. However, the original idea for the blog was purely to write about writing as kind of motivation to me. In fact I don't always have anything to say on that topic and when I've had a good writing day (and the novel is almost almost at completed first draft but the finishing line keeps moving) the last thing I want to do is type anything else. So, blogging I might be in the future but I will be expanding content to other life obsessions and observations so I hope that you still want to read. In fact I do have something to say on writng today: I read in the Times that a man, fed up with receiving rejection letters along the lines of 'I enjoyed reading it but....', and convinced that no -one was actually reading his stuff, decided to embark upon an experiment. He scanned in the instruction manual for his washing machine, divided it into chapters and sent it in. Lo and behold a rejection letter arrived. 'I enjoyed reading it but....'. I have decided that there is no point getting into a spin ( sorry) about the state of the publishing industry. Look on it as a positive thing. If an agent can enjoy reading a washing machine manual then how much better is my novel? Besides I bet many a reader is like me - stuck in a queue or a bathroom with nothing to read I will read the instructions on the back of a shampoo bottle rather than be bored. So perhaps it was quite an interesting manual. But this year I watched Run for Glory- what I call a 'hotel TV programme', i.e. somthing i'd only watch when I'm all on my tod in a travel inn in Birmingham. In fact I got hooked and followed the progress of a group training for the marathon. Two had breast cancer, one was twenty four stone, one was blind and disabled from an accident, another was assessed at the start as having the fitness levels of someone in a coma. After training from Sally Gunnell and Steve Cram all of them finished and in quite respectable times. Which puts me moaning about high arches into some kind of perspective. Plus on the day I saw a guy being interviewed who started at midnight and walked the course backwards before running it again. ( He didn't walk backwards. I mean he did the course in reverse!) It took him seven and a half hours to walk it. And I thought - I can do that it I put my mind to it. So I did what I do for everything and looked up on the internet to see if anyone else thought it was acceptable to intend to walk a marathon rather than start running and end up walking because it is a ridiculous distance, and it is - there is a whole community out there of walkers and lists of walker friendly marathons. So I am going to give it a go. Only I'm not telling anyone because then I will look a right prat when I don't do it. So you must eat this blog when you have read it. It turned out that I had already done the most important stage of the training without even realising: I had been the week before to M&S and bought a bag full of there amazingly cheap but very good quality T-shirts and jogging pants. Ok, with yoga in mind but hey, exercise is excercise. Then I commenced research. My Mum ( who has always walked everywhere) reckons she can walk from her house to Penrith in 50 mins which she says is 3 miles. Thus she can do 16 min miles. If she can I can ( with practice). So after teaching yesterday I went for a walk around Salford Quays with pedometer clipped to my hip. the weather was gorgeous, the buildings interesting, the water calming. And I did 21 min miles. Not fantastic but hey, its my first day. I'm a beginner. I'm supposed to be slow. And besides, Dad reckons home to Penrith is only 2.6 miles. I have sent them out to measure it. So I got in the car and drove the route. It's exactly 2 miles. YES!!! My pedometer must only be clocking every other step. Which gives me 14 min miles which is a very acceptable starting base. Hence happy girl in trainers. Now, which aromatherapy oils do I mix for muscle aches again?